On Sat 28th October, 2006, somewhere in low Earth orbit, a small bit of wax on a satellite heated up and melted, right on cue, releasing a sprung aluminium door and illuminating the inside of a telescope with solar ultraviolet light. Astronomers call this moment “first light” – the first time that the telescope fulfils its purpose and takes an image of what it was always meant to. EIS’s first light image came through in real time, as we huddled around a laughably ancient (but very important) computer screen in the bowels of the mission control centre; but we couldn’t have asked for a better first glimpse. Left-hand X-ray image from HInode XRT shows the position of EIS’ slit and slot fields of view on the Sun when the EIS telescope door was opened. The trio of images on the right shows XRT, EIS transition region and EIS corona images seen with the slot. A small active region is seen near the bottom of the slit. Lower panel shows the spectrum taken from a single pixel along the dashed slit seen on the full-Sun XRT image. The EIS spectrometer was pointed at a really lucky combination of the two most common sets of conditions on the Sun: a solar active region, where intense magnetic field pokes through the Sun’s surface; and the background ‘quiet Sun’, the Sun’s normal state in the absence of these strong fields. It gave our team the perfect demonstration that EIS was working well and revealing the ingredients, flows, heating and cooling of the million-degree solar atmosphere. EIS was the last part of Hinode‘s three-instrument payload to go live. The months leading up to this were stressful for a lot of people concerned. Most recently, we’d been taking, reporting and checking measurements of all the instrument’s vital signs at every overhead satellite contact we could muster. Then, our instrument engineers from across the world would make sure it was all behaving normally, as they pain-stakingly brought EIS up from its boot state to the state in which we could start using it for scientific observations. Being involved in that work gave me a lot of respect for the guys who were there with us to commission the instrument, and I’d like in particular to thank Jason Tandy (EIS’s chief instrument engineer), Louisa Bradley, Charlie Brown, Clarence Korendyke, Hiro Hara, David Brooks and Matt Whillock for keeping a cool head and sense of humour throughout those often intense days. The seven years since first light have brought observations, discoveries and questions that we didn’t imagine on that first day: EIS was designed to observe a largely uncharted part of the spectrum, to probe the vibrant corona and transition region of the Sun. In those seven years, there have also been huge advances in atomic data calculations, plasma theory and numerical simulations of the solar atmosphere from beneath the surface to the corona. The feedback between these different disciplines in solar science enriches the whole subject area; solar physics feels like it has moved on a lot between 2006 and 2013, with EIS playing a lead role in that evolution. A lot of us who are involved with the Hinode project are now thinking about the seventh mission conference that’ll take place in the mountains of Japan’s Gifu prefecture in just two weeks. I’m looking forward to a reunion with some of the people who were in that room when we got the first spectrum, of course, but also to find out what our unique instrument is continuing to bring to science at large. And I’m proud that EIS has made a powerful contribution to our understanding of our parent star and how that star affects its planets, of which our pale, blue dot is one. 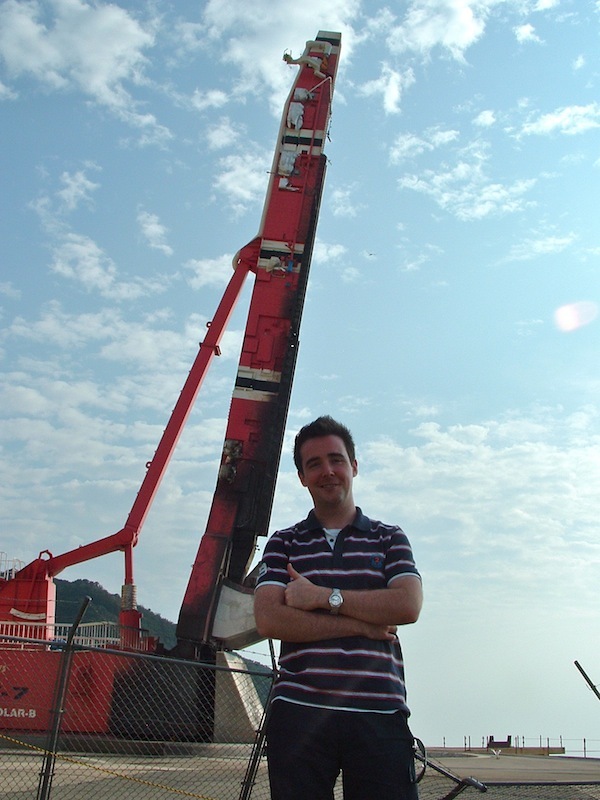 A younger me, at the launch rail in Uchinoura, a couple of hours after Hinode took to the skies. I have a strong personal connection to this mission. I was a scientist-in-residence at ISAS and still am a so-called “chief observer” for the UK on its EIS spectrometer (don’t get excited: there are a lot of “chiefs” in Hinode nomenclature). I was in Japan from before launch, got to see it successfully “born” by a Mu-V rocket from Uchinoura, and then returned to ISAS to help out in the process of commissioning the satellite’s EIS spectrometer, getting the data to start flowing from the instrument, and learning how this mission actually worked. The same is true, I think, of any substantial work. A mission is a living thing: just like a book, Hinode left its many authors’ collective desk and took on a life of its own. In the months and years that followed launch, we learned how this complex system interacted within itself, with us, and with the wider scientific world. Almost simultaneously, NASA’s STEREO satellites were launched and our perspective on the solar system changed again, and its scientists, engineers, and other staff will have their own stories to tell. The experience of Hinode was profoundly life-changing, professionally but also personally, and I look on my time at ISAS and in Japan with great fondness. By chance, I recently found a video message I made, for (now fellow-blogger) amacrojot, on the night after I moved to Japan. It makes me chuckle to see the “pre-experience” me, hear his less-diluted accent, and think of of what was going to happen over the next three years there. The reason I bring this up is that science isn’t all just about contributing to the economic success of the countries involved, although it can’t help doing that. Science also gives you a much, much broader experience. You travel, you’re exposed to different ways of thinking, and for every frustrating problem or situation you encounter, you also come across one of the most surprising people who can solve or see the way around it. And space science has this collaborative international nature that produces these great moments so often. 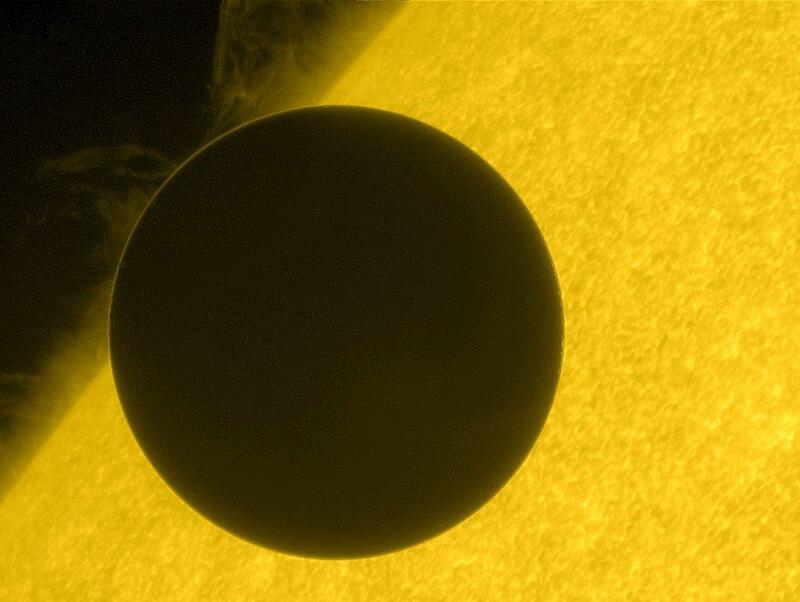 The transit of Venus, EIS-Style! On 2012 June 5 and 6, the Hinode observatory joined thousands of telescopes around (sometimes literally around) the world in watching Venus cross the face of the Sun. 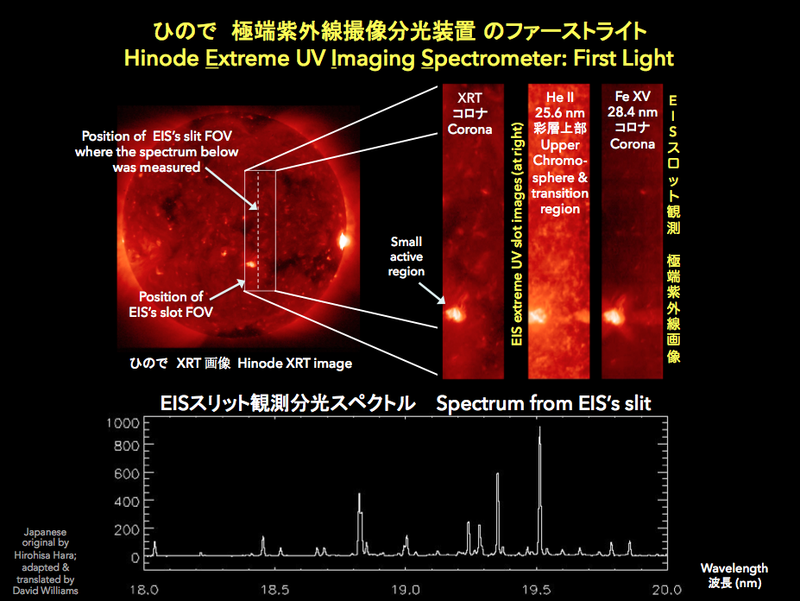 Hinode’s Extreme ultra-violet Imaging Spectrometer (EIS) had a few scientific and technical goals in mind in observing the transit: from looking for the interaction of the solar wind with Venus’ atmosphere; to using the precisely known path of the transit to work out the minute roll of the telescope’s field of view – what you might think of as “which way is up?”. In this movie, you see Venus first quite far off the Sun’s disc to the left (solar “east”), but it’s still silhouetted. This is because the Sun’s corona extends far beyond its surface. Then, we see it going (conveniently!) past a bright active region – 2nd and 3rd panels from the left – and a dark coronal hole – 4th panel – before exiting on the solar west. The wavelength of light that we use here is 195 ångströms, which is the wavelength emitted by iron so hot that it’s lost 11 of its tightly-held electrons. It’s possibly of interest that these are what we call slot data, whereas we also have “slit” spectra that will reveal much more about the precise balance of ions and electrons in the solar atmosphere and (hopefully) Venus’ atmosphere, too. It takes a lot of people to achieve data as seemingly simple as these, so thanks in particular to David Brooks (NRL/GMU), Shinsuke Imada (NAOJ), Toshifumi Shimizu (ISAS/JAXA), Alphonse Sterling (NASA) and Kunichika Aoki (NAOJ), as well as many other members of the Hinode team, for arranging these observations so expertly. 1) The gaps in the coverage are due to what we call “orbital events”: these are when the satellite passes through radiation zones — when the detectors are bombarded with particles to create a TV static effect — or when the sunlight is blocked for a short while by the Earth’s atmosphere, a transit of a different nature!